No. 12-1, Jalan Zapin K/KU5, Bandar Bukit Raja, 41050 Klang, Selangor, Malaysia. 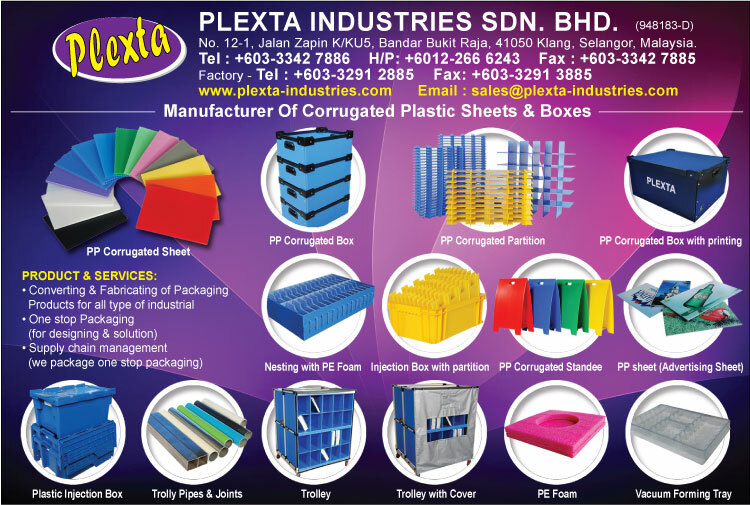 Plexta Industries Sdn Bhd commenced operation in 2011 as a manufacturer of plastic corrugated sheets, boxes, and layer pad products. We value added the sheet by fabricated into returnable packaging products such as boxes, nesting and articles for industrial applications and commercial use. We also custom design and manufacture boxes and trays to suit our customer’s special requirements. We paid high attention to our quality of our products and assure our clients that receiving our goods would be 100% satisfaction. Plexta Industries Sdn Bhd also provided service to assemble designed “Plexta” pipe joint trolley boxes to Multinational Companies for their production and assembly use. In order to be the market leader locally and internationally, we are still constantly developing new product to be add to our existing range of products in order to create new opportunities in the developing market.